Are big innovations possible within nonprofits? The recent Social Innovation Camp proved a highly successful experiment in bringing together social activists, web developers and others who believe the best way to get things done is to get creative people together and cook ideas rapidly. I've reported over here how eighty projects were filtered to six for intensive development over a weekend, and why I think this model will be significant in future. Are there any researchers out there who can help me with this question: how do you research potential adoption of social media in memberships organisations if the people you are talking to may not understand what you are talking about? Matthew Taylor, at the RSA, is one of relatively few chief executives of nonprofit organisations who have a blog ... now others are joining in, and getting encouragement. Following news here that that Stephen Bubb, chief executive of the organisation for nonprofit chief executives acevo has started blogging at Bubb's blog, a couple of more established bloggers have launched a support group. Is your organisation World 1 or World 2? People's reluctance to embrace social media may not result just from difficulty with the tools, but rather from their worldview and how far they like to believe in simple cause and effect, rather than complex interactions. Two specialists in the use of collaborative methods highlight this. David Gurteen is a knowledge management specialist reflecting on the use of social media. 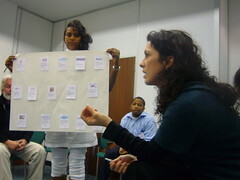 Jack Martin Leith is a long-time expert in the use of Open Space methods for face-to-face events, focussed on co-creation. David contrasts World 1 and Word 2 view's in a matrix - see below - writing in his latest newsletter. "We are moving from a world where we were told to do things and where things were structured or planned for us to one where we get to decide what works best for us. We are moving from a mono-culture to a highly diverse ecology. I've found that one of the most effective ways of helping organisations and groups understand how to bring social media into their communications mix is to play through their possible plans in a workshop game. We did that at the Ruralnetonline event, and also at the Circuit Riders conference, shown here. More recently I ran a workshop for PR and communications staff who are working in housing associations, and I've put the presentation and game that I used on the social media wiki. As I reported earlier, it certainly brought out the challenges for association staff. I think this version could be the basis for a game designed for membership organisations, because at the beginning I introduced a simple matrix to help participants think through who they are trying to help, in what way.